This is a wonderful capture, JM. The colors, the lines, the angle...everything comes together here beautifully. The lamp is nice ... but how RED is that building. That's a bright, rich RED! A very handsome, historic street lamp! i like the red wall a lot ! This photo is eye-popping! I love the composition. The lamp is cool, but what I do love is the colour of the building! What a pretty red building! 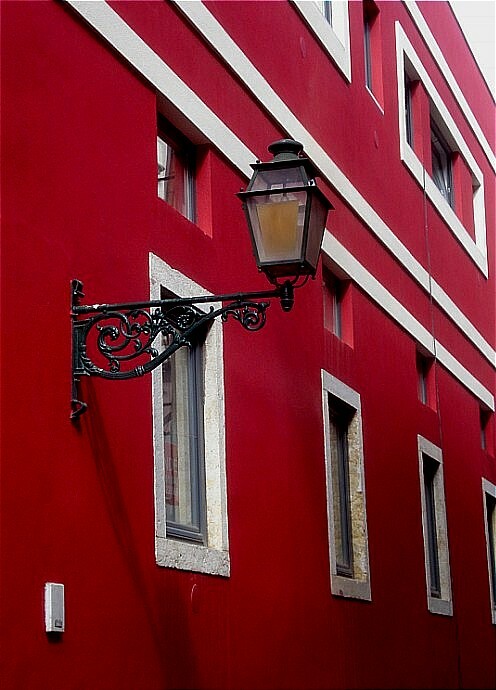 Great contrast between the nice old lamp and the unusual color of the wall behind. Wonderful colours! In a couple of weeks I hope to walk around there (again)! What a crazy red for a house colour! I love the color and the lamp. Both very pretty!! Oh may I buy this delicious photo JM? I love it !! LOVE, LOVE, LOVE this red wall ! I want to live right there. The ironwork is gorgeous, and that red is amazing! I really like the colors and the way you composed this. Love that deep, rich red.